BEAUTIFUL, HAND POLISHED MAPLE WOOD HAND BAR WITH STEEL LEGS FOR SOLID SUPPORT. PORTABLE 4 FOOT LONG AND ADJUSTABLE FROM 30 TO 50 INCHES IN HEIGHT. GREAT GIFT FOR YOUR FAVORITE BALLERINA. 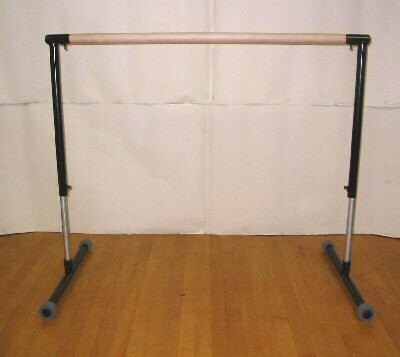 4' BALLET BARRES...our beautiful wooden Ballet Barre offers years of trouble free use for the home, studio or professional....VERY STURDY, WEIGHS LESS THAN 20 LBS....STAYS IN PLACE WHILE YOU EXERCISE!